10' 4" high, 2' 9'' wide at its widest and 6'' at the sides. 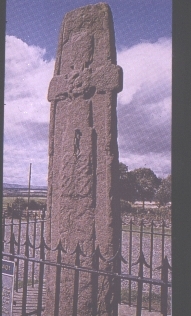 Upright rectangular cross slab, tapering slightly, the arms of the cross are 2 inches wider than the rest of the slab. Front: Cross divided into five panels the centre of the cross has a eight spiral bosses around a central spiral boss, the other panels all contain interlace, at the base of the shaft this interlace is inhabited, with birds and beasts. The decoration on the cross slab is difficult to decipher, on the top there is a figure, unknown. Stuart, J., The Sculptured Stones of Scotland 1st, Spalding Club, Aberdeen and Edinburgh (1856-1867) Plate 60. Volume 1Stone, Sculpture, Scotland, History, Archaeology.